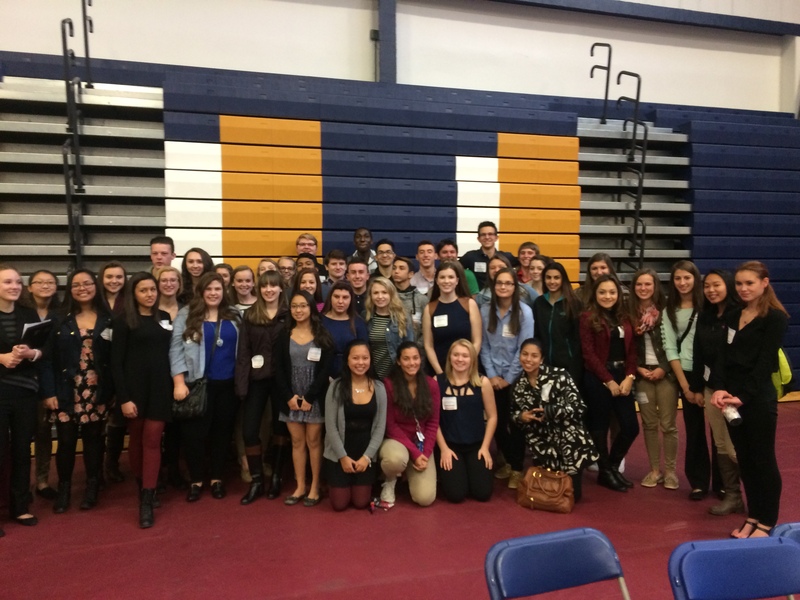 On Monday, October 26, 2015, Manchester Memorial’s DECA chapter attended the Fall Leadership Conference at the Southern New Hampshire University campus. Included in this event exclusively for DECA members around New Hampshire was the opportunity to attend an initial opening speech from the New Hampshire DECA Officers, a keynote speech by Tennessee native Amy Gallimore, two workshop sessions of your choice, and a great lunch provided for all attendees. The Fall Leadership Conference is something I attended last year as a first year DECA member for our Memorial DECA chapter. It was definitely well worth it. At the event last year, I learned a lot about networking and personal branding from the workshop sessions I went to. I am glad to say I had the good fortune of attending the conference again this year as a second year DECA member. This year, the workshop sessions I chose focused again on networking, but also applying to colleges and how to stick out to them among other students. The first workshop I went to was called ‘Evolution/Networking Like a Pro’. The speaker spoke for a bit about the importance of your handshake, smile, and eye contact when meeting someone for the first time. Networking is when you create a network of business people and other acquaintances for you to use. Adding people to your network is always beneficial. The activity involved was interesting to say the least. We got together with a partner and had to create a dance move and chant based on our name then had to duel other groups via rock, paper, scissors. It definitely got me to meet new people and to have fun with it. The second workshop session I attended was called ‘Swab the Deck/College Matters’. We conducted an activity where we acted like pirates trying to gain the title of “first mate”. This led into the speaker’s speech about how to stand out and how to stand out to colleges. This, again, was interesting to say the least but a lot of fun and it showed how to make ourselves someone the colleges want at their campus. The other two workshops were the two I did not attend but were also a blast to other students who did attend them.. The Fall Leadership Conference is a DECA conference that has been around for some time now and is really the first meeting for New Hampshire DECA for each school year. This is why it is an important event to attend for anyone involved in DECA. I will definitely go again next year, and I hope each and every one of you will be invested enough to join DECA and attend the Fall Leadership Conference next year as an important member of our Memorial DECA chapter and New Hampshire DECA.